Imagine my delight. I designed a pair of socks. My idea to make socks out of a zig zag pattern (called Wave) from the Learn to Knit Afghan book worked out. Here they are. 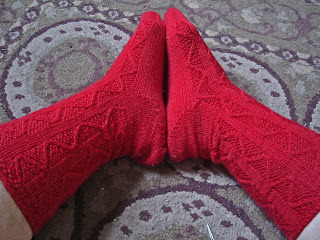 I call them Mimus after the excellent young adult book I listened to as I knit. The character Mimus is a court jester. Does that not fit the oh-so-entertaining zigs and zags of the design? I changed the pattern for knitting in the round and for stitch count. I used 2.25 mm needles at a gauge of 8 stitches per inch, which seems to be my standard. I cast on (from the top down) 64 stitches to make a sock with an 8" circumference. The yarn was the inexpensive Fortissima Socka by Schoeller-Stahl in 75% superwash wool and 25% acrylic, and it is scratchy. I don't recommend this yarn (though it might wear well), and will probably make these socks again in something more luxurious. After all, that is a major appeal of sock knitting: luxury made affordable. Here is the pattern for Mimus. I figured out how you can keep the same stitch count and change the gauge to make different sizes. The stitch pattern is fairly elastic. It is also relaxing to knit. Left Twist: With right hand needle at back of work, knit through the back loop of second stitch in row, then knit through the back loops of both first and second stitch and drop both stitches from needle. Right Twist: With needle at front of work, knit through the front loops of next two stitches, then through the front loop of first stitch only; drop both stitches from needle. 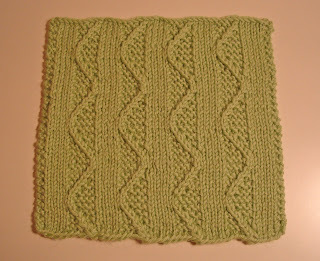 Join and knit 6 rounds for rolled edging at cuff. Add 5 rounds seed stitch for elasticity. Continue working rounds, but divide stitches, half for instep, and half for sole. Continue pattern on instep half, and knit all rounds on sole half. Work 12 more rounds. Shape heel on half the stitches (32), using your preferred method. 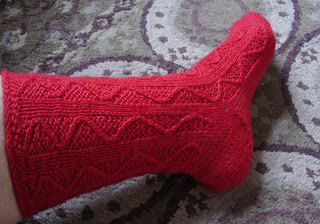 I used the Priscilla Roberts Gibson short row heel with yarnovers. Directions for this heel are available in a feature from the Interweave Knits Fall 2000 issue. The article is also available online. I am providing a link to an html version that is incomplete. If you click on the link on the top of the html document, you will get to the full article in Adobe Acrobat format. I'm not sure how to link to the Acrobat document itself. You can also access this by searching Priscilla's Dream Socks. This article has a lot of interesting and useful sock-knitting information. After heel is complete go back to working in rounds on all 64 stitches. Continue in pattern on instep stitches and in stockinette (all knit) on sole stitches. When foot portion is 6 (6.5, 7, 7.5, 8, 8.5) inches long, measured from flat part of heel (which hits at lower portion of shaping line), begin toe shaping. Round 1, Needle 1: knit 1, slip next 2 stitches and knit them together through the back loops from the right hand needle (ssk), knit to end of needle. Round 1, Needle 2: knit to 3 stitches from end of needle, knit 2 together, knit last stitch. Round 1, Needle 3: as needle 1. Round 1, Needle 4: as needle 2. Repeat these 2 rounds until there are 32 stitches left (8 on each needle). Then just repeat Round 1 until there are 16 stitches left (4 per needle). Place these stitches on 2 needles, 8 stitches on each, and close the toe with Kitchener Stitch. Beautiful, especially in red. Amazing how different it looks from the swatch. The 3-dimensional aspect shows off the texture even more. That is a really cute sock pattern. Congratulations! I really love your socks! That pattern is so pretty!